Wazua » Club SK » Politics » Huduma Namba Je Una yako? 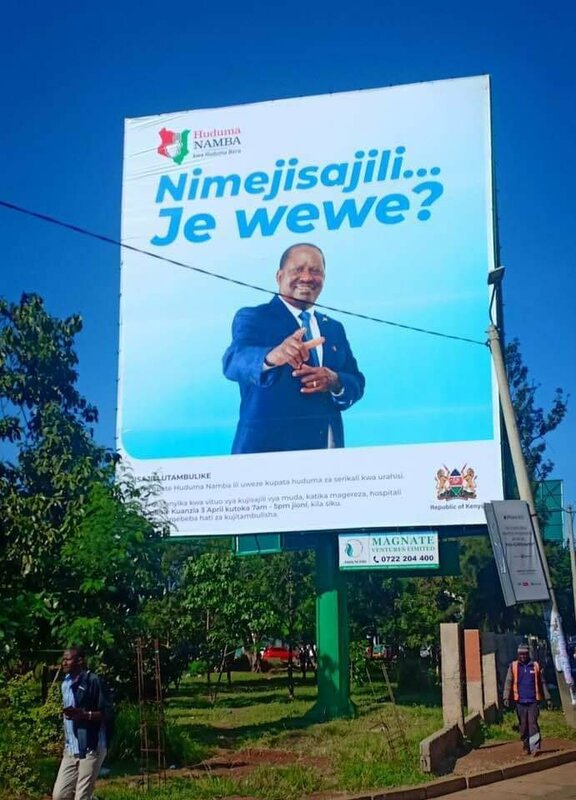 Huduma Namba Je Una yako? The news is that people are registering in big numbers. Almost 6 million so far to date. Good progress!! I do not believe they have hit 6M, we haven't seen queues at chief's office, etc. I think it is a psychological affair for those who haven't registered to feel like they have been left behind, to encourage them join the que. Kama baba is in the mix, then those numbers are real. Power of the Handcheque. Take home message to me was Patience is key when accessing government of Kenya services.Dealing with GoK has been and will always be difficult and a horrible experience. It is an endurance sport that should be admitted to the olympics(my opinion). You will get upset and feel like slapping someone, but you will have to kula humble pie(jeuri yako) style hiyo hiyo. Don't walk into huduma centre expecting services of an air-conditioned CFC-Stanbic banking hall. @Fyatu, did they ask for your childrens' (if you have any) nemis numbers? Yes, they did but were a bit casual about it. They also asked for birth certificate number for my 8yr and 6yr olds. My kitinda mimba(3yrs) did not qualify. Note that kids over 6yrs will have to be physically present for picha and biometrics collection.The more reason you should go early because i cannot imagine the chaos of adults together with their children lining up on the last-last days trying to beat the deadline. This is not right. Will the process be complete ie cleansing etc? The colonialists got us really good. People are queuing for this number and when you ask why, "because the govt said so". Me I have no intention to register unless I can see a benefit. Say, the huduma card becoming my id and Dl combined. These threats will amount to nothing. One of these junior govt chaps like the CAK CEO will find themselves in Kamiti for contempt. The threats could be a hint that the government has no benevolent motives. Also, since Raila is part of the script, they are almost certain that there'll be no protests against an evil and corrupt leadership. Of course. But the gava will just frustrate you when you go to ask for them passport etc etc utangoja mpaka expiry date ifike. And people will register to avoid such frustration. Does this mean you don't need birth certificate for under 6 yr old kids? When your kiddos get to 6 (class 1 age) they will have to present their data to Nemis and I think by then they will give their bio-metrics information then. Even the Huduma number registration process will be ongoing, people are born and die every day. When you threaten, it means its not working. Just like the 1.5% on housing. This is symptom of relying on Itumbi and Alai for PR. Same here... no intention to register until I see the benefit/ need. Imagine if they told us that once you register, we no longer need to go to ntsa for the digital driving license. I have been planning to dump my old booklet DL but the queues at ntsa are too much. One must be there by around 7am and waste the whole day. Like @Tycho said, the govt sincerely believes the services they offer are favours to the citizens. Have you ever participated in a census? No one has been forced/threatened to do anything...forget about Wangusi's statement, it is not policy. So far over 10 million Kenyans have registered with no one holding a gun over their heads. But NOTE that what he said is very enforceable. Alma, why would you want to go look for your mother's photocopy of ID so as to get a passport? NAIROBI, Kenya, Apr 19 – Kenyans living in the Diaspora will from May 6 be able to register for the National Integrated Identity Management System also known as Huduma Namba. President Uhuru Kenyatta informed Kenyans abroad that the exercise will run for 45 days at embassies and consulates. These people are jokers! So now they want all of us in the US to visit an embassy within 45 days to get this number? Again ... has anyone thought about the logistics of it all?